We recommend a 4 ft x 18ins x 18ins hutch for Dutch rabbits. This should also contain a sleeping section. The hutch should also be off the ground and placed in a sheltered position not facing the mid-day sun or direct wind. Most rabbits will be quite happy outside for all of the year providing that they are given adequate bedding in the winter. As well as a proper sized hutch we think that it is important that the rabbit is given the opportunity to exercise on the grass in a secure run on a regular basis. 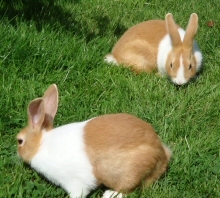 It is also good for a rabbit to graze on the lawn providing the grass is free from dogs/cats faeces and lawn treatments. Diet is very important for a rabbit and the diet you feed needs to replicate a wild rabbits diet as near as possible. By doing this you prevent health problems that can effect rabbits teeth and digestive system. Wild rabbits forage for grass and herbs morning and evening, and we therefore recommend that our rabbits are fed twice per day morning and evening. 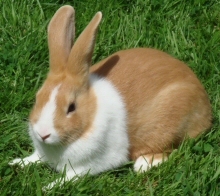 We suggest that a commercial rabbit pellet is fed in the morning and a good quantity of hay is fed in the evening. We particularly emphasise the use of hay as it helps to keep the rabbits teeth down to the correct length and aids the rabbits digestive system therefore preventing potential problems of both constipation and diarrhoea. We recommend a pelleted food rather than a multi coloured mix as many rabbits become selected feeders and eventually have a diet that is not complete in terms of nutrients and other vitamins. Clean water should be available at all times. Can be given mostly in the form of green stuff: - Cabbage, Broccoli, Brussel sprouts etc and also small amounts of starchy food such as Carrots, Apple and Swede may be given as treats. We do not recommend lettuce. Rabbits also enjoy wild plants such as dandelion and chickweed. The more a rabbit is handled the tamer it becomes. 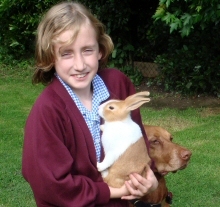 Handling has to be done carefully using both hands and cradling the rabbit to your chest with one hand supporting the weight of the rabbit under its bottom. Never pick a rabbit up by its ears. Rabbits are social animals in the wild and are therefore happier not kept alone. Unfortunately two male rabbits will fight from about 4 months of age, and a male and a female will start producing babies from not much later than that. That leaves the option of 2 females however they need to be introduced to each other from a very early age, or what vets normally recommend as the ideal paring is a neutered male with a female. Rabbits do not mix well with guinea- pigs as they often mount them. Dutch rabbits are a natural size and shape for a rabbit, and therefore providing they are fed a balanced diet including plentiful hay and water they should live a healthy life and should never need to see a vet. The main reasons for seeing a vet are because a rabbits teeth have overgrown and this is usually caused because the rabbit has not had enough hay in its diet., and the hay helps to wear the teeth away keeping them at the right length. 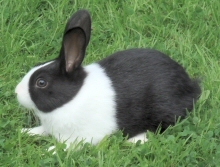 Flystrike is another reason that rabbits need to see a vet in the summer, this is because a fly has laid its eggs on soiled fur on the back end of the rabbit. The most likely causes of this are that the rabbit has been over fed and under exercised and is too fat to groom its self properly. Again this is easily avoided by giving the rabbit plenty of hay in a regularly cleaned out hutch.